It is becoming increasingly common for human rights norms to be transferred between legal and political systems and this book is a fresh approach to the intersection of transnational law and the protection of cultural difference beyond the single state border. 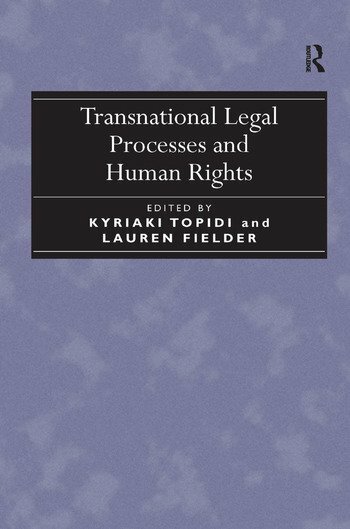 It investigates how the construction and evolution of human rights norms are transferred in transnational legal settings and asks whether law should reflect, express or control any given aspect of culture. The chapters explore the ways that law and cultural identity may or may not co-exist, particularly in circumstances where a prima facie clash is observed. Examining legal approaches to cultural differences from a comparative perspective and across a wide range of locations, the book covers topics such as juvenile punishment, religious defamation, religious rights and conflict between industry and indigenous communities. It will be of value to those working in the areas of transnational and comparative law, as well as those concerned with human rights and the intersection of law and cultural difference. Contents: Foreword, Robin Palmer; Introduction, Kyriaki Topidi and Lauren Fielder; Part I The Construction and Evolution of Human Rights Norms in Transnational Legal Settings: Universal human rights and cultural relativity: conflict or reconciliation?, Ehsanul Haque; The impact of, and resistance to, the use of foreign law on juvenile punishment in the United States, Ruth Hargrove and Roberta Thyfault; Horizontal impact of human rights - dialogue between constitutional and international law, Barbara Grabowska; The subsidiary application of the European Convention on Human Rights by constitutional courts in the Czech Republic and Poland, Marian Kokes and Piotr Mikuli; Legislative attempts to prohibit the use of international law and Islamic law in US courts, Mark E. Wojcik. Part II The Protection of Cultural Difference within Human Rights Traditions: Preserving traditions or breaking the mold? Transnational human rights processes in the People's Republic of China and Hong Kong, Carole J. Petersen; Combating religious defamation: an exploration of blasphemy in Islamic thought and international practice, Ali M. Abid; African courts and African values: harmonizing international human rights and customary law, Lauren Fielder; Exercising religious rights in European classrooms: value conflicts between the national, the supranational and the transnational, Kyriaki Topidi. Part III Transnational Economic Entities, Human Rights and Cultural Identity: Narrating indigenous rights, indigenous rights professionals and agreements between mining corporations and indigenous communities: Ã qui l’homme sauvage?, Deval Desai; Corporate responsibility and human rights in the context of an international constitutional legal framework: the case of Angola, Angelica Anatolie Tsakiridis; Index. Kyriaki Topidi, PhD is a Senior Lecturer and Senior Researcher at the School of Law of the University of Lucerne. She teaches courses and researches on religious rights and has a research background in minority protection and EU law. She has published widely in these areas. Lauren Fielder, JD, LL.M. Professor Fielder teaches African Law, Protection of Vulnerable Groups and Transnational Litigation at the University of Lucerne, where she is the assistant director of the Transnational Legal Studies Program. She writes and speaks about human rights issues in Africa. She studied at the University of Texas in Austin.